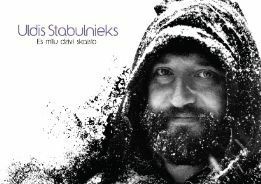 Uldis Stabulnieks last album was released this fall under the name of ‘’Es mīlu dzīvi skaisto’’ (I love the beautiful life). Microphone records announce the album with the words, ‘’ Honestly we are not sure if Uldis Stabulnieks, in his Latvian big self , would allow this release as it is – he recorded the album on his own, alone, playing all the instruments and thinking about it all as a rough draft, which potentially someday could reach out to other musicians for completion. Album was heard for the first time on Novemeber 25th at Riga Congress House before the Uldis Stabulnieks remembrance concert. His family members will receive all of the composer’s royalties and a part of the income received will be used for the memorialization of Uldis Stabulnieks memory.